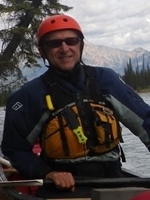 In mid September we canoed the Kootenay river from Settlers Road down to Canal Flats. The river had been dropping daily for a couple weeks and it was not pushy at all however the low flows did make for some constricted passages and much manoeuvring was required. We put in just upstream of the bridge spanning the river near the Nipika resort. We have to track the boat upstream for a few metres to reach a clear channel and then we point it downstream and the game is on. There is a must-make turn right before the bridge and we sail through and bob away down around the corner. The scenery is good but the water demands constant attention. Rocks, waves and finding the right channel keep us very busy. Ledge rapids appears and there is only one option open on the right and we pass through no problem. If it is all this easy I figure we should be OK.
We round a corner into Boulder rapids and somehow we are into the waves before we are ready for them. Constant correction strokes and braces but we are going too fast and a fat wave bursts over us. In seconds it is over and we pull to shore, bail the water and try to unclench our sphincters. My bow paddler looks like he has just seen his short life pass before his eyes. I hope that this is as hard as it gets or we will be counting fish. Eventually after five hours of fun and games we come to Palliser rapid. We pull out and scout and throw a stick in to watch its passage. There is a sharp ridge of rock crossing the river here leaving a slim passage through at low flows. We could walk around but after discussion we run it and the boat slips through the sneak line no problem leaving us cheering as we eddy out. We camp here at the confluence of the Palliser and the Kootenay at a beautiful but hard used and abused site. A couple hours later a pair of hearties in a rubber raft come whirling around the bend and spin through the rapid like a top before bobbing past. No shirts, no PFD’s and no cares. I used to climb mountains with folks like that. They are for the most part dead. The morning brings another perfect day and we paddle on through some of the best river scenery we have ever seen. Why this was not included in the nearby Kootenay National Park is beyond me. The water is easier save for few tight corners and the big waves at Pedley Falls. High gravel banks and calm pools lead us on past the White and we stop at Gibraltor for a snack and the kid peels off his wet suit. It is easy cruising to Canal Flats and we pull in and pack up and motor home more than a little pleased with the most fantastic piece of river we have ever had the pleasure to run. Great TR and Pics. Love that trip! Thanks for the trip report and the beautiful pictures. Now, for sure, the Kootenay is on my list of "must-do" trips. Could a fellow pick up a coupla of trout on the way down? We paddled the Kootenay River on Sept Long weekend this summer. We paddled from Macleod Meadows to Horseshoe Rapids on day 1 and then from Horseshoe Rapids to next bridge on day 2. I thought that Boulder Rapid was definitely the toughest of all of those we went through. (But I only swam in flat water. ) We had a blast and were in awe of the scenery. Cannot think of a much better place to paddle. We camped at Horseshoe Rapid for the whole weekend and did shuttles each day. This is a great river for canoeing. You most certainly could catch a fish or two. There are some fantastic pools and it is known for its trout. If one is going to spend the time to canoe the Kootenay River please also consider the White River. I spent a whole week two Septembers ago and did the Kootenay from Dolly Varden picnic site to Canal Flats and then the lower portion of the White (+/- 35Km). Stencil's pictures are awesome, but still don't tell the whole story. The White is even better!! great report and photos! thanks for sharing. Great pics of a beautiful place,,thanks. "The mind creates the abyss, the heart crosses it"
Thanks for the report and photos. Definitely gotta get down that way soon.